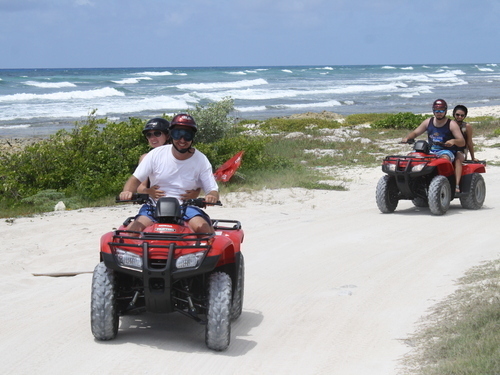 Round trip transportation from meeting point near all cruise ship piers in Cozumel! Air conditioned and fully insured transportation! English speaking certified ATV guide! 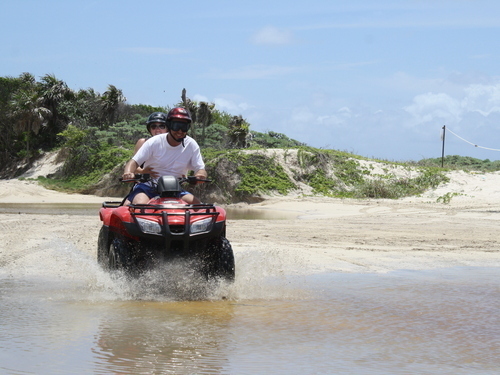 2 seater, 250cc Honda, semi-automatic All Terrain Vehicle! 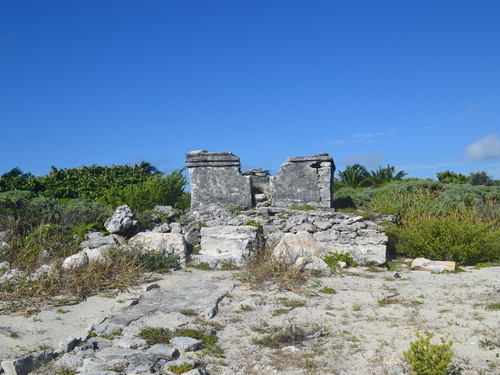 Visit the secluded "Xpalbarco Mayan Ruin"! Complimentary delicious Mexican lunch and purified water! 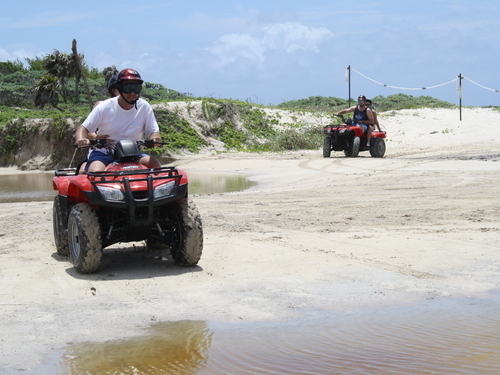 Sandy off-road trail including riding on the beach! 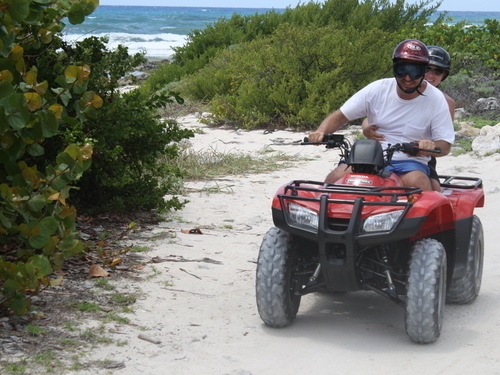 ATV insurance and fuel surcharges included! 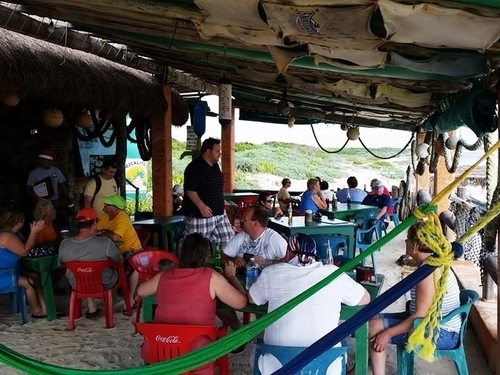 Optional beach time and cash bar available after the excursion at famous Mezcalitos Beach Bar! 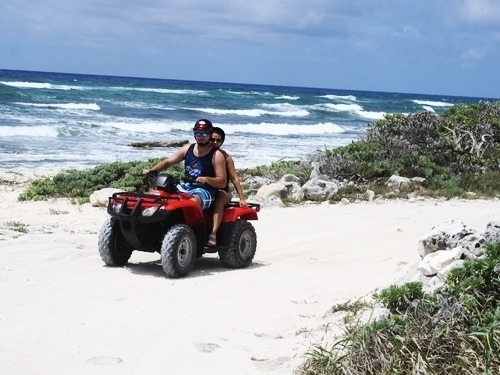 We want to invite you to join us on the wild side of Cozumel. What makes it wild? 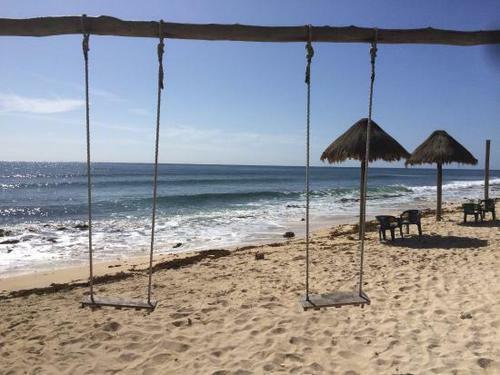 No resorts, no crowds, just miles of beach sprinkled with beach clubs here and there. 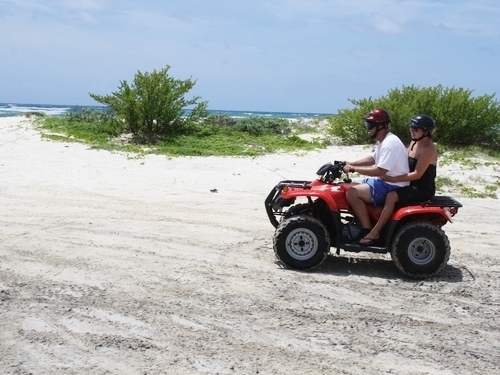 But, you'll have the chance to explore too while driving your own ATV. 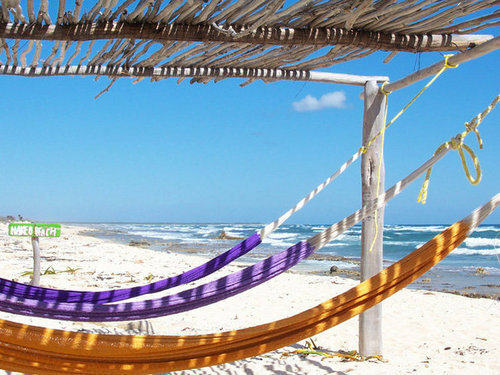 With this guided excursion you'll see sights that most never do, visit a small Mayan ruin, and then end the day at a beach club that is a local favorite, and for good reason. This day has it all! 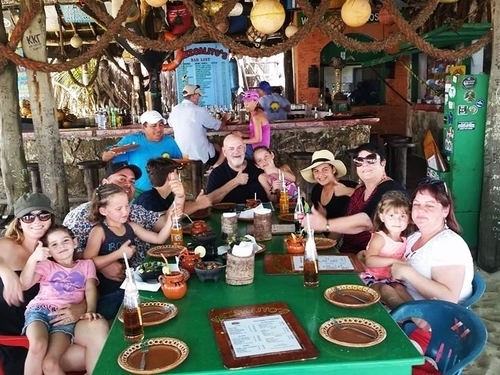 To start this great excursion you will meet with the guide just minutes away from your cruise ship terminal. 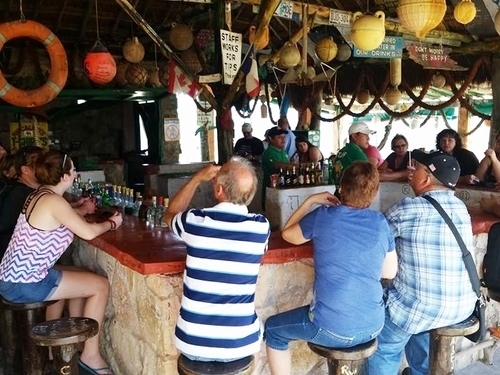 Hop aboard a taxi, cost included and head out for a scenic 25 minute ride to the north end of Cozumel, the wild side. 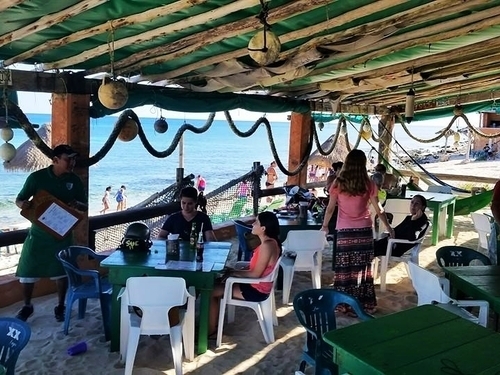 Once you get to Mezcalitos Beach Restaurant, your home away from home on this excursion, you will be given instruction and safety tips from your English speaking guide. Then you'll receive a helmet, climb onboard your 250cc Honda, and you're off! 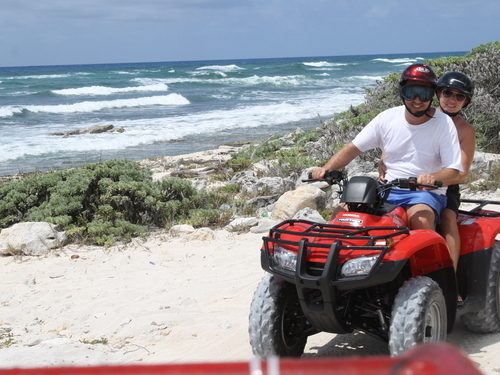 You can ride single, or double, check the check the shopping cart below for options and prices. 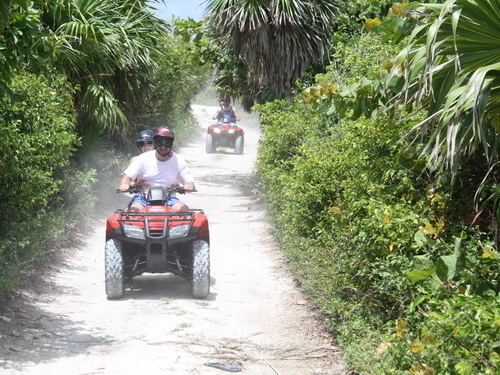 Your guide will then take you along sandy trails, through the jungle, next to the beach, you name it. 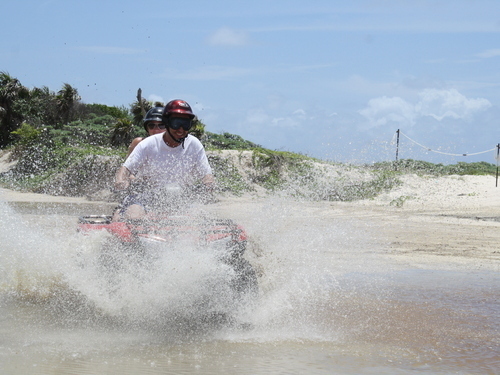 Be prepared to get a little dirty, it's all part of the fun. 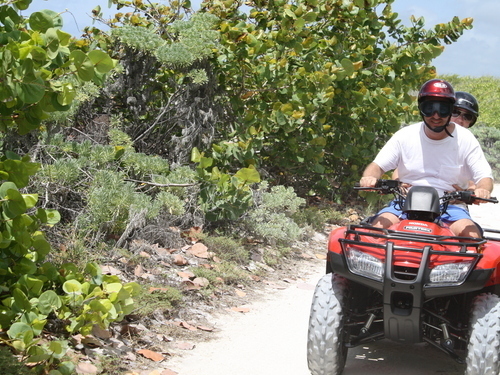 No worries about getting lost, your guide is local, experienced, and knows the trails. 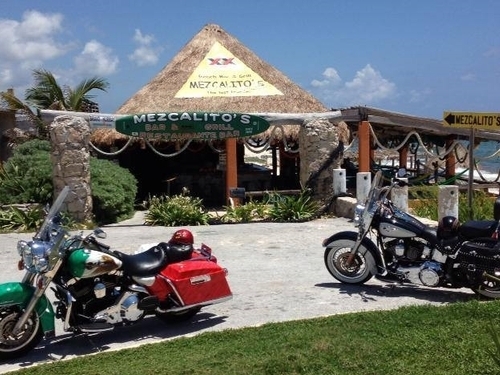 You do have plenty of time to enjoy as well since your riding time is approximately 2 hours. 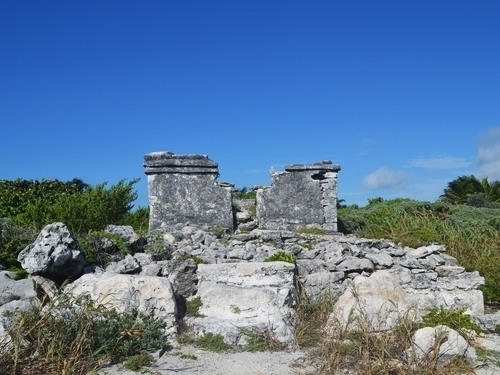 Your guide is leading you to Xpalbarco, a small Mayan ruin site. Once there you can be refreshed with some cold water as your guide gives you inside information about this ruin, the culture, and why Cozumel was so important in ancient times. Learn how and why Maya women would make a pilgrimage here at least once in their lives, and marvel at how they managed to do it and the dedication that drove them. 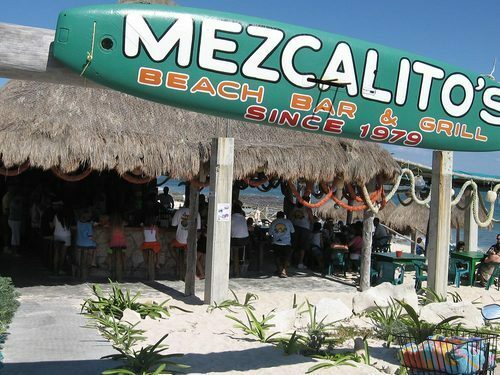 Then it's back on the trails to get return to Mezcalitos Beach Restaurant. 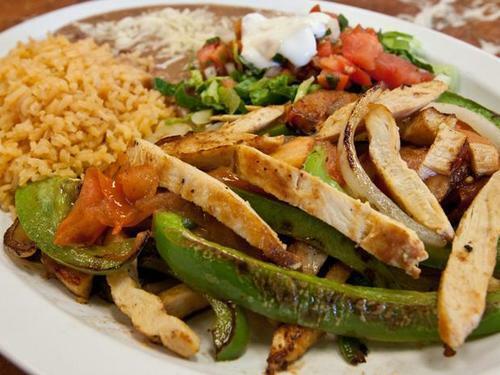 You'll be served a delicious lunch of chicken fajitas and a cold beverage, which is included. 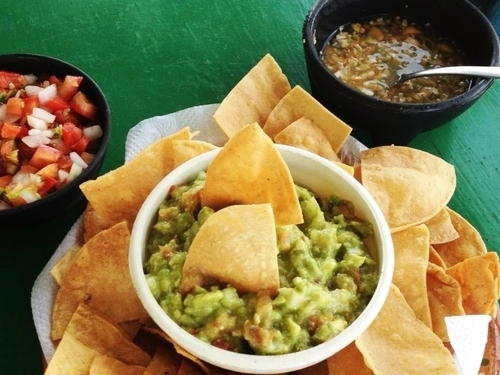 You also have the choice to purchase more from the restaurant and on-site bar, at your cost. 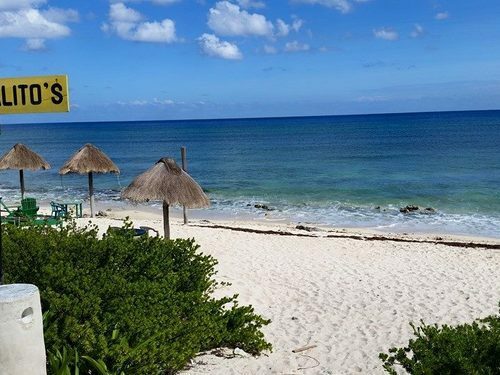 After 30 minutes of lunch with a spectacular view, you can choose to stay at this charming beach club and enjoy the amenities, or be returned to your cruise ship terminal, included in the price. If you choose to stay, you can just take a taxi and return when you are ready, at your cost. We suggest you wear comfortable clothes and closed toes shoes. 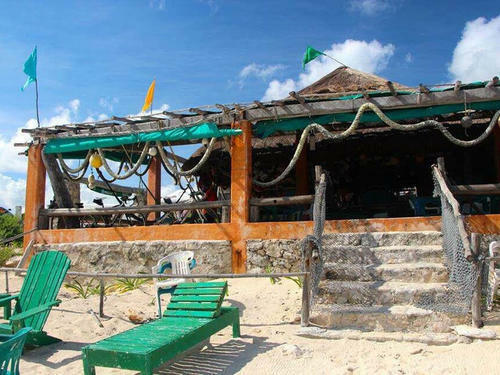 Bring along sun protection, sunglasses, insect repellent, towel and cash for balance payment, beverages, tips, etc. 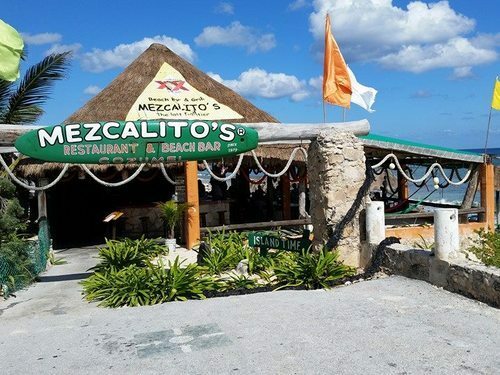 Mezcalitos Beach is not typically a swimming beach, but you can enjoy a great ocean breeze and view. The no-lunch option is only available for single riders. Minimum participation age is 7 years old. Children from 7 to 17 years old must ride double with an adult. The minimum driving age is 18 years old. Please present your valid driver's license. 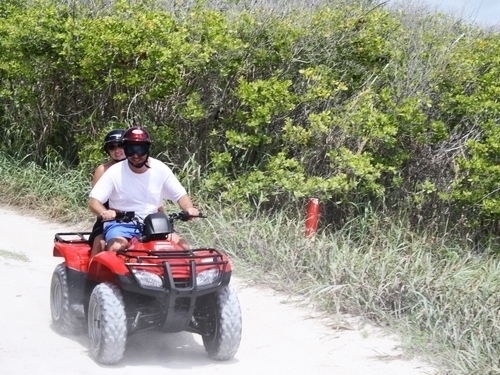 Maximum allowed weight is 400lbs (180Kg) for single or double ATV riding. Closed toe shoes are strongly recommended for your safety. This excursion is not wheelchair accessible. A. The approximate cost of a taxi back to your cruise ship terminal is $25.00 USD for up to 4 passengers. A. 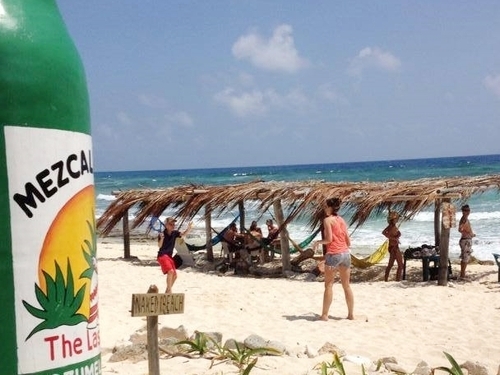 You might be rescheduled, please call us on the hotline number. A. 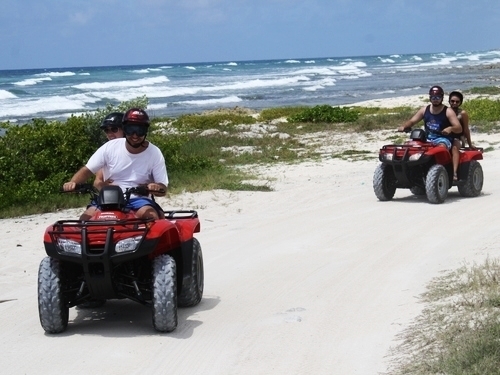 The Cozumel Wild Side ATV and Virgin Beaches Excursion can be operated in rain or shine, however, it is the local operator who will decide if the excursion may be canceled due to safety reasons.